TDA (Them Digital Assistance) was founded in 2003 as a natural continuance from the original owners, L&M Imaging Systems (L&M), after a management buyout. We are a central London IT company, offering a full range of IT support services and are re-sellers of computer hardware and software. We specialise in the complete installation and maintenance of Apple Mac and personal computers, printers, network design, e-mail systems and Windows and Apple file servers. We also work in partnership to provide other core services such as online backup, hosted email and Sharepoint services, hosted VoIP, networking, internet connectivity and telecommunications. Our range of services encompasses a ‘one stop shop’ mentality, for all your IT support needs. We can advise and sell you the equipment you require and provide a highly efficient IT support system. In short we quote, supply, install and maintain. The core of our clients range from small to medium size businesses, including extensive interaction with a variety of advertising agencies that specialise in the publishing, pre-print and graphic design industry. This allows us a personal, friendly ‘hands-on’ approach although we’re not averse to handling bigger clients! We also look to nurture long-term relationships, watching our clients grow as we do. We have built a solid reputation on providing fast, efficient and reliable technical assistance, cementing the trust needed in a time of crisis. Because we have over 60 years of combined experience in the IT field, we can provide you, the client with an exemplary standard of service and commitment. Based in Islington EC1 we are conveniently located to provide IT support solutions to clients in the central / greater London area. As each business' needs are different, so are our charges. As well as a superlative and comprehensive hardware maintenance cover, we are delighted to offer a variety of support plans. 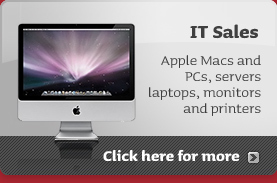 IT Support Services – contact us now for more info on the range of services we offer. TDA project managed the complete transition from Mac based Servers and Workstations to Microsoft Windows based Servers and Desktops over 2 weekends. Under a tight deadline, we project managed the installation and transition from one small business Server to three Rack Mounted File, Exchange email and Terminal Servers for the London head office. TDA have been involved with VCCP since their inception. VCCP started in 2003 with 16 employees and have grown to around 230 strong. TDA now look after all of the Macs throughout the whole of the chime communication group and are the sole suppliers for all their Apple Hardware and Software. Configured all 120 Macintosh workstations to Windows Active Directory for easier management of security and logins. Updated all agency Macs to the latest version of Adobe Creative Suite 5 graphic software meeting an extremely tight deadline. Assisted in the set up VCCP Berlin. Click here to view our complete client list.